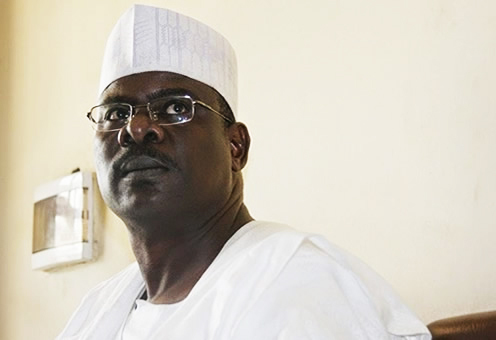 The Nigerian Senate on Wednesday suspended its former leader, Ali Ndume, who had asked for investigation of allegations of perjury involving Senator Dino Melaye and importation of a bullet proof range rover with fake documents involving Senate President Bukola Saraki. The suspension came barely two months after Mr. Ndume was removed as the Leader of the Senate. The suspension of the senator was based on the report of the Senate Committee on Ethics, Privileges and Public Petitions which recommended that the senator be suspended. Ndume had asked the Senate to look into the allegations of vehicle importation against the President of the Senate, Dr Bukola Saraki and the alleged certificate forgery against Sen. Dino Melaye. The committee was asked to investigate the allegation and invited Sen. Dino and Sen. Saraki to appear before it on Monday. When Senator Ndume appeared before the committee, he stressed that he did not petition the President of the Senate or Senator Dino but only asked that the senate looked into the allegations to clear the name of the institution and save the integrity of the red chamber. However when the Senator Samuel Anyanwu Committee on Ethics submitted its report, it stressed that Sen. Ndume lacked concrete evidence to have petitioned Saraki and Dino. The Committee said that the action of the former leader of the Senate dragged the name of the Senate and its president to disrepute and as such should be punished. The committee therefore recommended that the senator be suspended for 181 legislative days, equivalent of one calendar year. However, Sen. Matthew Urhoghide pleaded that the penalty be reduced to six months rather than one year. Sen. Peter Nwoboshi seconded the motion to review the duration of the suspension to six months. The Senate thereafter adopted the review and suspended Senator Ndume for six months.